Rockville Internal Medicine Group’s team of gastroenterologists provide consultation and continuing care for patients with digestive issues and digestive system disorders. 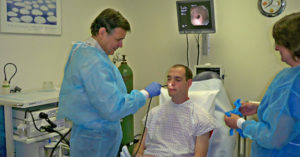 Procedures Performed at Hospital or Out Patient Centers. EGD and Sigmoidoscopy also performed under local anesthesia in the office. NOTE: The above documents available for download are in .pdf format.